Sanitized Octarians are a variation of Octarians that have been sterilized or disinfected. They resemble ordinary Octarians but with different coloration. 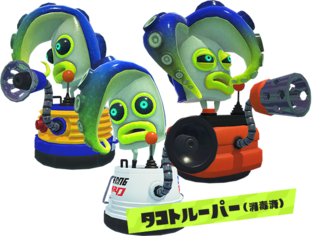 These Octarians have been sterilized with a type of primordial ooze created by Commander Tartar. The process of sanitizing results in the Octarian losing all sense of free will, allowing them to be controlled similar to robots as seen with the dialogue from Sanitized Octolings. Marina notes that the sanitized Octarians appear to have no pulse or signs of life. Sanitized Octarians are visually distinct from normal Octarians by their coloration: a blue-to-neon yellow gradient on their tentacles and eyes with black sclera and glowing aqua blue irises. Elite versions (such as Santizied Elite Octolings, Sanitized Deluxe Octocopters, Sanitized Deluxe Twintacle Octotroopers, etcetera) have a darker blue and the same yellow in the gradient. Their voices sound more digital and compressed and when splatted they briefly leave glowing blue pixels and glitch-like squares. Instead of the glitter-like effect that ink has in Octo Canyon, the Sanitized Octarians' ink resembles dishwasher detergent or hand sanitizer. Sanitized Octarians were first seen in the Octo Expansion. The sanitation is implied to cause the affected to lose their free will. Although the implication is that Octarians lose all free will after Sanitizisation, bios about Dedf1sh describes how "little of her former self remains", showing that, at least in some cases, Sanitized Octarians do retain some memories. This is further evidenced through the subtitle for the Drop the Bass Station: "Back like I never left", showing how the Sanitized Octostomp has remembered the previous battles against the New Squidbeak Splatoon. Agent 8 fighting a horde of Sanitized Octocopters using the Heavy Splatling in Octo Expansion. Agent 8 fighting Sanitized Octozeppelins using the Inkjet in Octo Expansion. Sanitized Octolings in the Octo Expansion, each carrying different weapons. A group of Sanitized Octocopters. Sanitized Octoling’s Octopus form and Agent 8’s Octopus form comparison. A Sanitized Octoball inside the NILS Statue Cannon. Sanitized Octoballs flying out of the exploding NILS. This page was last edited on 7 December 2018, at 13:39. This page has been accessed 137,085 times.